Historically the euphoria of December (the strongest month of the year) carries over into the first few days of January as the market continues to climb for the first couple of days. But by around the fourth trading day the exhilaration is wearing off and the market then falls for the next two weeks – the second week of January has been the weakest week for the market in the whole year. Then, around the middle of the third week, the market has tended to rebound sharply. So, quite possibly a gloomy start to the year for shares. But what is the outlook for the rest of the year? The FTSE All-Share Index ended 2015 down 2.4% on the year. This was the second successive year the market has had negative returns. This could be bullish for the outlook for the market in 2016 as it is very rare that the market falls for three successive years (since 1960 it has only occurred twice: 1960-1962 and 2000-2002). For further guidance we might look at the Decennial Cycle. This shows that since 1801 the average return of the FTSE All Share Index in the sixth year of the decade has been positive at 1.6%. 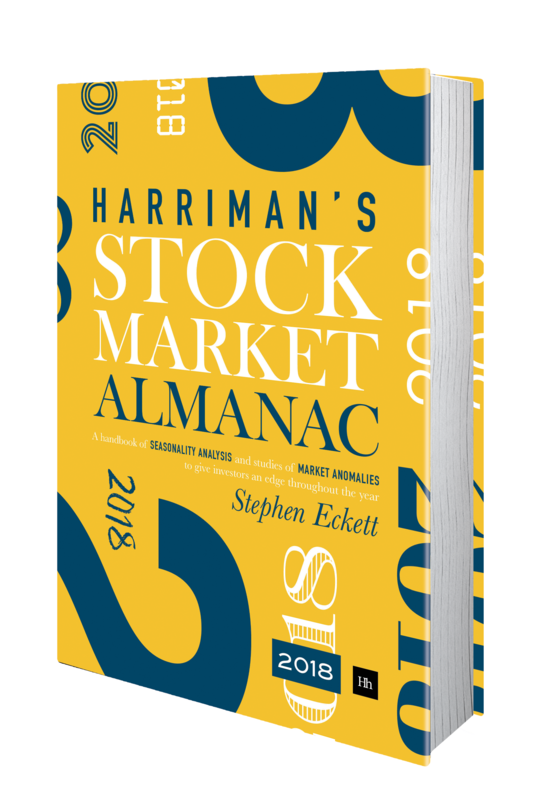 And if one wants to consider the lunar cycle, we could look at the Chinese Calendar ­ in this 2016 will be the year of the monkey, and since 1950 the S&P 500 (for which we have the data) has returned an average 7.3% in monkey years. Further articles on the market in January. Since 1984, the FTSE 100 Index has risen on average 0.38% on the first trading day (FTD) of January. The index has had a positive return on this day in 58% of years since 1984. Since 2000, the performance has been much stronger on the January FTD, with an average return of 0.67% on the day, and with positive returns seen in 69% of years. 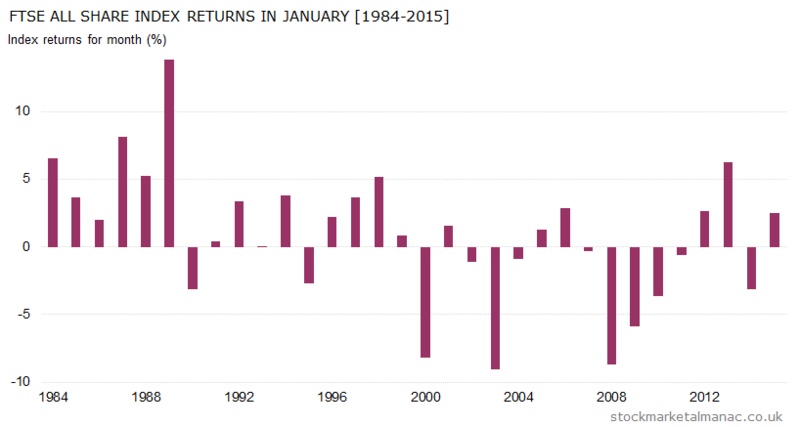 The following chart shows the returns for every January FTD since 1984. The following chart plots the average performance of the FTSE 100 Index during February since 1984. As can be seen, historically the market tends to rise for the first two-and-a-half weeks and then drifts lower for the rest of the month. The following chart shows the average performance of the market in January (1984-2014) and overlays the actual performance in January 2015. The market was unusually strong around the third week of the month, which led to its out-performance of the historic average for the month. The table below lists the sectors that have historically out-performed the market in January. The following table lists the sectors that have been weak in January. Generally, January is a very good month for investors. A recent academic paper (Vichet Sum, 2013) found that January has the second strongest average monthly returns for 70 world markets, and has been the strongest month of the year for 16 of those markets. However, this is no longer the case in the UK. Although January used to the strongest month of the year for the UK stock market (with an average month return of 4.5% for the period 1970-1999), this changed after the dot-com crash. Since 2000 the average month’s return has fallen to -1.8% and the market has risen in this month in only five years since 2000 – making January the weakest month of the year in the last few years. January follows the strongest two-week period of the year (the second half of December); and this exuberance traditionally carries over into the first few days of January as the market continues to climb for the first couple of days. But by around the fourth trading day the exhilaration is wearing off and the market then falls for the next two weeks – the second week of January has been the weakest week for the market in the whole year. Then, around the middle of the third week, the market has tended to rebound sharply. The month is better for mid-cap and small-cap stocks. On average, since 2000 the FTSE 250 Index has outperformed the FTSE 100 by 2.2 percentage points in January – the best out-performance (with February) of all months. Small caps do even better, out-performing the FTSE 100 by an average 2.7 percentage points in the first month. The out-performance of small-cap stocks in this month has been the subject of many academic studies and is called the January Effect. There are two other interesting anomalies in the month (that are also sometimes, and confusingly, called the January Effect). The first is a famous market predictor in the US which holds that the direction of the market in the whole year will be the same as that for the first five days of January. Research shows that the same rule works more or less for the UK market as well. The third effect comes from a U.S. paper written in 1942 which proposed that stocks rose in January as investors began buying again after the year-end tax-induced sell-off. As noted above, that has been less true in recent years. 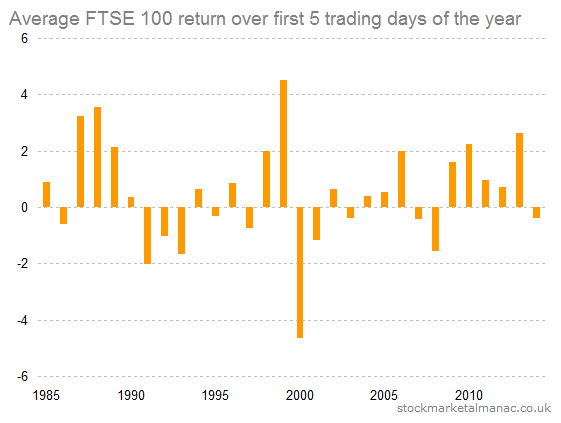 Since 1985 the FTSE 100 Index has increased on average 0.50% over the first five trading days of the new year. 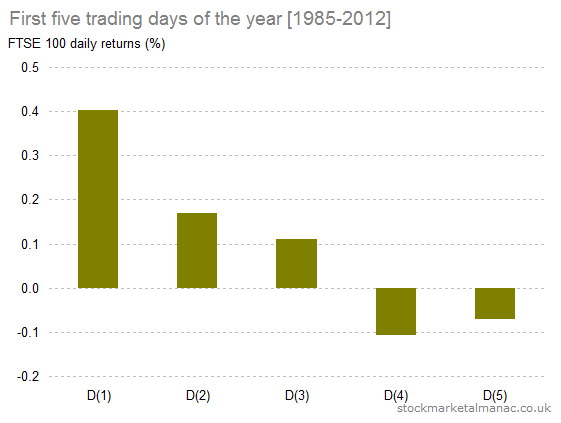 The following chart shows the market returns for the first five trading days for all years from 1985. For example, over the first five days of 1985 the index rose 0.89%. The following chart shows the daily returns for the FTSE 100 for each of the five days in the new year. 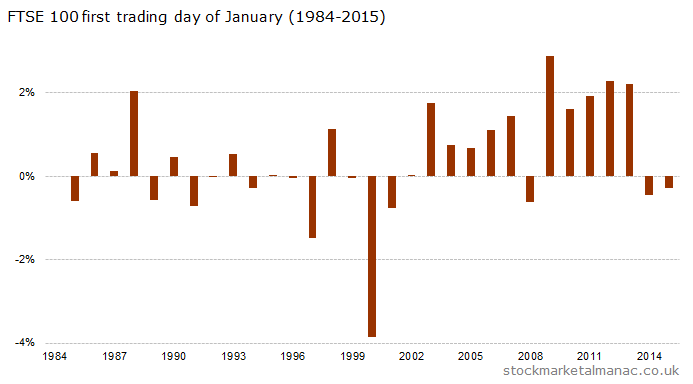 For example, on average since 1985 the index has risen 0.40% on the first trading day of the year. The following chart plots the average performance of the FTSE 100 Index during February since 1984 (more info on this type of chart). As can be seen, historically the market has generally risen for the first two and a half weeks of February, and then fallen back a little in the final week and a half. 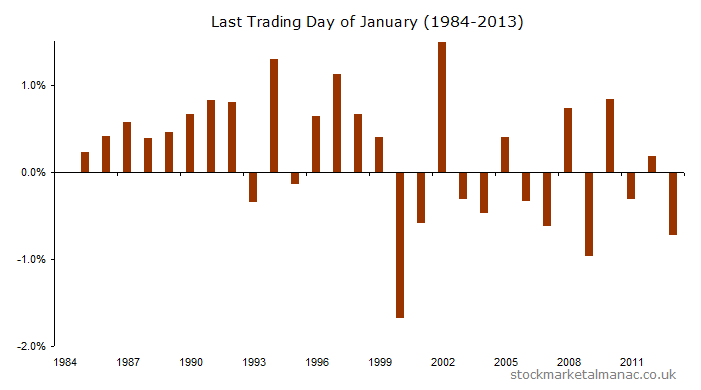 The following chart shows the average performance of the market in January (1984-2013) and overlays the actual performance in January 2014. In January 2014 the big difference from the average January was the big share sell-off in the final week and a half. Tomorrow will be the last trading day (LTD) of January. As explained in the 2014 edition of the Almanac the LTDs of months used to be stronger than average, but in recent years they have been weak.This can clearly be seen in the case of January from the chart below. From 1984 to 1999 the FTSE 100 only fell twice on the last trading of January. But since year 2000 the market fallen more often than risen on this day. Since 1984 the market has on average risen 0.19% on the LTD of January, with positive returns in 62% of all years, which makes the January LTD the third strongest month LTD in the year. However, as indicated above, things have changed since 2000: the average LTD return in January has been -0.17% making it the third weakest month LTD in the year. 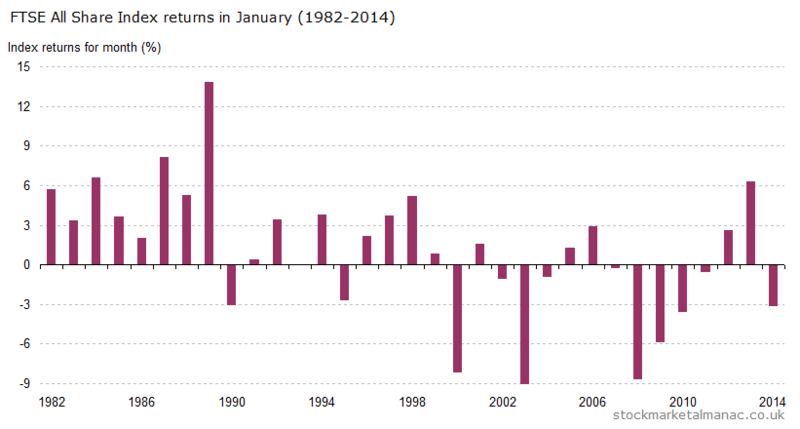 The following chart shows the FTSE 100 Index returns for every January LTD since 1984. The following chart plots the average performance of the FTSE 100 Index during January since 1984 (more info on this type of chart). As can be seen, historically the market starts strong the first few days but then sells off for two weeks, until rebounding strongly in the final week of the month. The following chart shows the average performance of the market in December (1984-2013) and overlays the actual performance in December 2013. In December 2013 the market was weaker than usual in the first couple of weeks, but the market then followed the historical trend when the Santa rally kicked in around the 10th trading day of the month.